Sheet vinyl flooring of your home is a durable, practical and an attractive choice for your high-traffic places such as baths and kitchens. It’s easy to install your self if you have got patience and time. Walk on the floor with pair of socks after it is glued down. Bubbles trapped underneath the sheet can be easily felt by this way. Take them away towards the edges. Apply a trim around the wall’s base by nailing or gluing. Screw down the thresholds. Check once more for exposed adhesive as early as it dries. Now allow the adhesive to be dried according to the manufacturer’s specifications before you allow the traffic on it. First roll the vinyl sheet out, facing upwards, in a wide and open area. Align the vinyl in a direction of the space it is going to cover. Use a tape measure a ruler, mark floors dimensions on sheet vinyl with non permanent felt-tip marker. It is a good to leave one inch or a two extra inches in your measurements and trim to fit once vinyl is in the place. Cut sheet vinyl to floor shape use straightedge and flooring knife. Take time in this phase. Mistakes along edges may be covered with the trim but major blunder will be costly. Wipe felt pen marking with wet sponge. Re roll vinyl to make sure back side is very clean. Carry vinyl to place you are going and lay a new floor. Sweep or vacuum floor clearing for any dirt and debris. Unroll sheet vinyl to dry to fit it to floor. Do trimming that needs to get perfect fit. 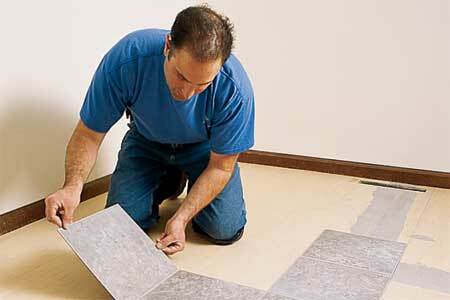 Once vinyl becomes smooth and flat you are ready to stick. Roll a side of vinyl up from outside edge to center point. Leave another side flat on floor. Deal with exactly odd shaped room will require more complexed strategy. It also takes a little time for careful fitting and for trimming but process will remain same. Pry open a gallon can of the floor epoxy with screwdriver. Use notched trowel in spreading a line epoxy about one foot wide and all along floor to rolled flooring. Work from center towards outside edge of room. Unroll vinyl slowly by pressing it to adhesive. You may use kitchen rolling pin in helping seat it well also to get air bubble out or may rent roller. Spread one more foot wide strip epoxy on floor. Unroll vinyl farther and then press in to epoxy. Continue applying epoxy and unrolling vinyl until this half of floor is covered. Wash epoxy off exposed surfaces with hot water before it dries. Repeat process on other side of room.